My WISPs (works in slow progress) are progressing, though true to their name, they're both moving along slowly. As I've mentioned before, I'm joining some of the stars for Scattered Stars, and the piece is now about 18" x 10" at it's widest parts. Trying to keep the stars looking scattered, rather than in regular rows, means joining some interesting shapes together. 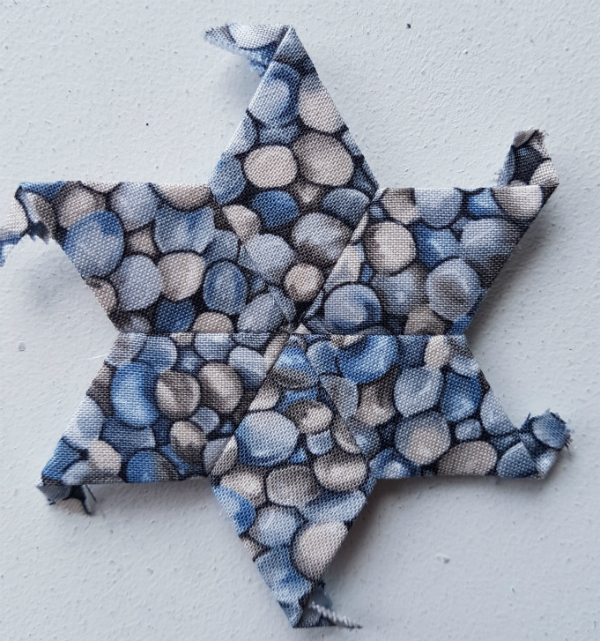 When I came across small scraps of this pebble fabric, I couldn't resist making a star out of it. I think this will be the next star I join in. My Hexie Rainbow quilt is one round bigger than when I shared it last. Next up will be two rounds of black. 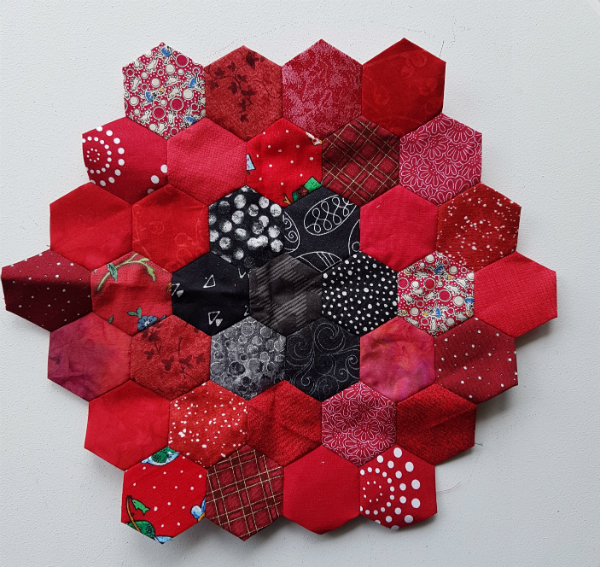 I have a bunch of black hexies basted, but I want more, in more prints, so I can mix up the prints a bit, so I'm not ready to start those rounds yet. There's less than a month left of school, so I'm thinking once summer break gets here I'll be able to spend more time handstitching with a cup of tea in the mornings than I can manage right now. Come on, summer! I made three of these adorable 6" churn dashes for a secret sewing project that needs to be sent out near the end of June. I love this Kona jade! 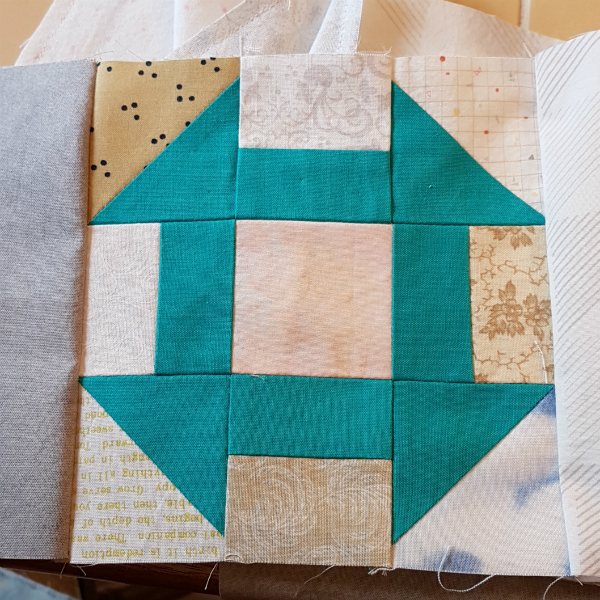 I usually go for projects with lots and lots of pieces, but this one is mostly just simple patchwork, and it is coming together really quickly. The rows are sewn together already and I'll soon have a finished top. And, of course, the quilts for the seniors are still taking up a lot of time. 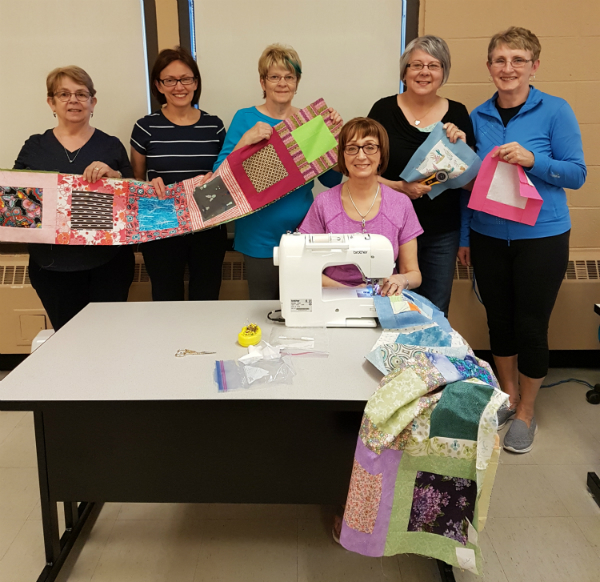 This week I was invited to drop in on a local sewing group who have been a huge help with joining blocks into tops for this project and I snapped this picture of them. This is just a small portion of the army of quilters near and far who have come together to make this project work. I now have 9 finished quilts in the house and 20 tops ready to be quilted. 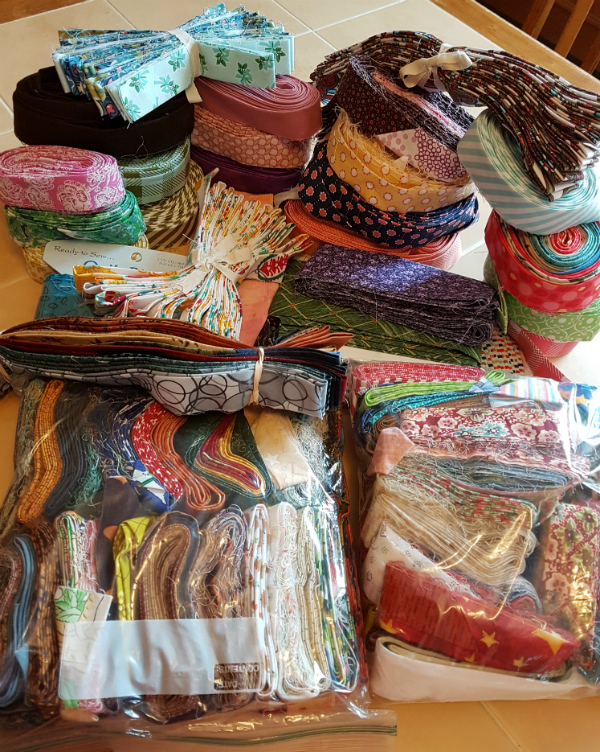 There are also still blocks bundled together, but not yet sewn as well as tops that are being sewn by others but haven't been returned to me yet. I'm thinking a total of 50 quilts won't be a surprise! I've gone through all of the donated batting, so I've started using donated money to buy batting. There's no shortage of backing or binding yet, though, so it's just a matter of getting things matched up and given out. 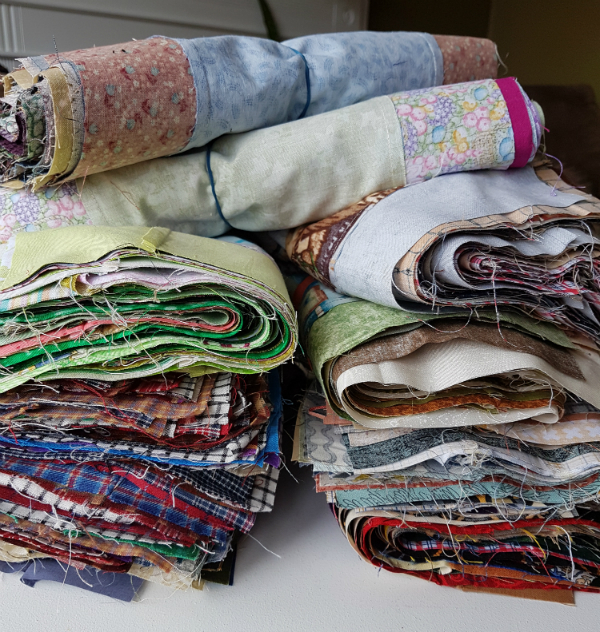 This week I'm aiming to give a bunch more out to be quilted so they can move from the 'tops waiting to be quilted' pile into the 'finished quilt' pile 😊It really is amazing to watch these quilts come together! And, on a non-sewing note, we have some moose who are hanging out around town this year. It's not exactly rare for moose to be seen in town, but they don't usually stick around for so long. These ones have been seen over and over the past couple of weeks, and they don't seem at all concerned about the people around them. 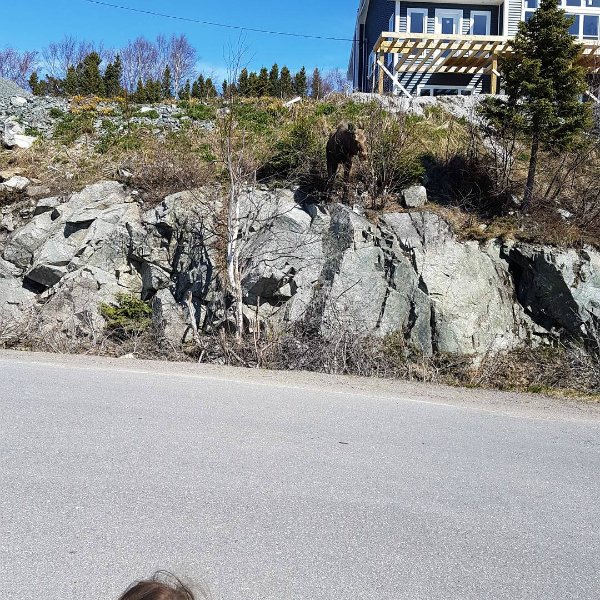 While walking with the kids this morning, I was very grateful that moose are herbivores and I didn't need to worry that this guy was looking at me and the 4 littles with me as a tasty snack! So, that's where things stand around here! What are you working on lately? Being forced to be still drives me batty. Don't get me wrong...I am very good at being lazy when I choose to be. Reading for a couple of hours, scrolling Instagram, reading quilty blog posts or hand stitching in the chair with a cup of tea are all perfect. Sitting in that same chair for two entire days because I just don't have the energy to do anything else? That makes me crazy! Unfortunately, over the past couple of years I've had a few instances of weird colds that start off with me being stuffed up or having a scratchy throat and then just turn into sheer exhaustion that leaves me unable to do anything but sit. And the whole time I'm sitting my mind is running through all the things I had planned to be getting done that day, and getting more and more frustrated because I can't actually do any of it. Recently I had one of those forced-to-sit-and-do-nothing weekends and I hated it. While I was sitting there, thinking about how much I hate to be still, though, I thought of the verse that says, "Be still, and know that I am God" (Psalm 46:10). Being forced to be physically still doesn't guarantee that I'm going to focus on God, though, as evidenced by my to-do list running constantly through my mind as my frustration level mounted. Which is probably why the command in this verse does not necessarily mean a physical stillness, but rather a spiritual one. The original word used for "still" has the connotation of letting something go slack and of not holding it tight anymore. Psalm 46 as a whole is about God as our refuge, which is actually how the psalm starts: "God is our refuge and strength, an ever-present help in trouble. Therefore we will not fear, though the earth give way and the mountains fall into the heart of the sea, though its waters roar and foam and the mountains quake with their surging" (vv. 1-3). The psalm feels to me like a study in contrasts - the trouble and upheaval in this world set opposite the steadiness and constant protection provided by God. I think that's what God wants us to see when He tells us, "Be still, and know that I am God." It's not that we have to physically sit and do nothing, but that our minds and our spirits can step away from the craziness and upheaval of this world and remember how He provides for us. Remember how He protects us, how He is our safe haven, no matter what is going on in our lives. 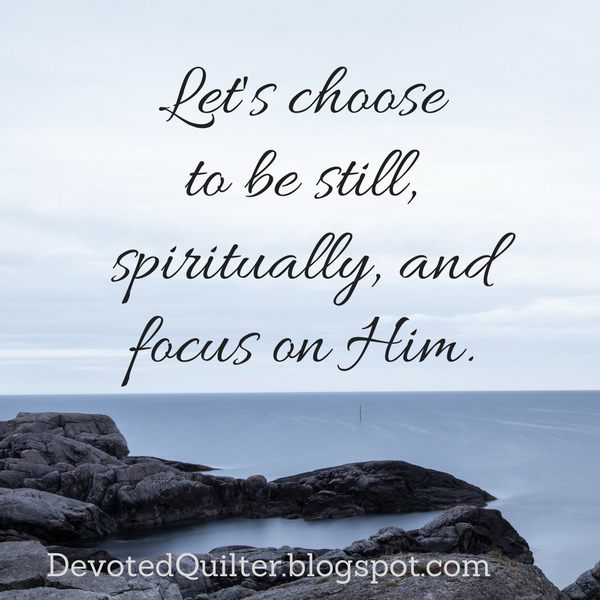 We can choose to still ourselves spiritually and remember that He is God. Though our world may feel like it is nothing but chaos and confusion, He is our refuge and strength, our ever-present help in whatever trouble we face. Even while we scratch things off our to-do lists this week, let's choose to be still, spiritually, and focus on Him as our refuge and strength. I deal with toddlers all day long. Sometimes when they want to do something, they ask for it over and over and over and over and over..."I want colour." "I want colour." "I want colour." It doesn't matter that I've already said they have to wait until I get the lunch dishes cleared off the table so there's room to colour, they just keep asking and asking as if saying it more often will make it happen sooner. Or maybe they want a toy someone else already has. "I want phone." "Yes, but it's Fiona's turn." "I want phone." "I heard you, but it's not your turn." "I want phone." "You still have to wait." Saying it over and over won't change the fact that they can't have it yet. 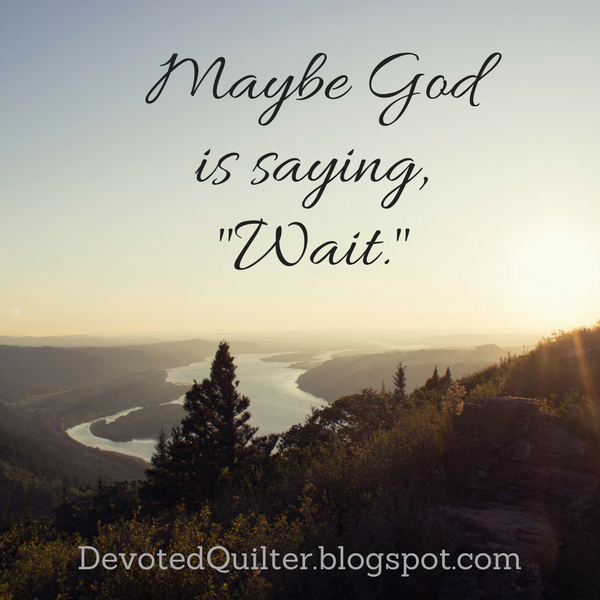 It makes me wonder how often God hears our prayers and answers with "Wait," but we keep asking and asking and asking, as if the more we ask the faster it will happen. How often does He shake His head at our incessant requests for the same thing, all the while knowing that He has answered and we just won't listen? This question is further complicated by the fact that God wants us to come to Him with our requests, and even encourages us to come repeatedly. Luke 18:1 actually says, "Then Jesus told his disciples a parable to show them that they should always pray and not give up." The parable of the persistent widow tells the story of a widow who came to the home of "a judge who neither feared God nor cared what people thought" (v. 2) and pleaded with him to "Grant me justice against my adversary" (v. 3). Finally the judge granted her request, not because he wanted to do the right thing, but because the widow kept bothering him (v. 5). The point is not that we can wear God down by constantly asking for what we need, but that we should never give up in asking. I think the key here, though, is that the widow was asking for justice against an adversary. She was asking for something she needed. Jesus concluded that parable by saying, "And will not God bring about justice for his chosen ones, who cry out to him day and night? Will he keep putting them off? I tell you, he will see that they get justice, and quickly (vv. 7,8). When we are asking for something we need, then God will answer and He will do so quickly. But He's not working on our timetable and we are to be persistent in the asking until He meets our need. But how often are we simply asking for what we want because it will make our lives easier? Never mind the plan God has for us, or how He wants to shape us through the hard times in our lives. We want everything to be easy and pleasant and good. And if it's not the way we want, we pray and pray and pray and pray that God will make it the way we want. The toddlers I look after have to learn patience. They need to learn to take turns with the toys and they need to learn that the whole world doesn't revolve around what they want. It can be a hard lesson for them to learn. We may be adults, but there are times we behave like toddlers, wanting God to let us have our own way all the time. Just as that isn't what is best for toddlers, it isn't what is best for us either. What if God is saying to us, "Wait. This has to happen first and then you can have that." Or what if He is saying, "This is not the time for you to have this thing you want. You need to learn patience. You have to wait." Or even, "No. There is a lesson for you in this." After all, God didn't remove the thorn in Paul's flesh, but left it there as a reminder that His grace is sufficient (2 Corinthians 12:8,9). And Paul stopped asking. Maybe we need to stop asking for some things, too. I love my dishwasher. We use it constantly, running it pretty much once a day and it saves me tons of time in the kitchen. When Paul and I went away a few weeks ago, my in-laws came to stay with the boys and afterwards one of the boys said to me, "Nana didn't use the dishwasher the whole time she was here!" I think he was in awe, lol. As I said, I love my dishwasher. It does a great job cleaning dishes so I don't have to. But there are always some dishes that don't come clean. You know what I mean, right? Those spoons that ended up nested together and there's spaghetti sauce trapped between them. Or the measuring cup that flipped over and now it's full of filthy water. 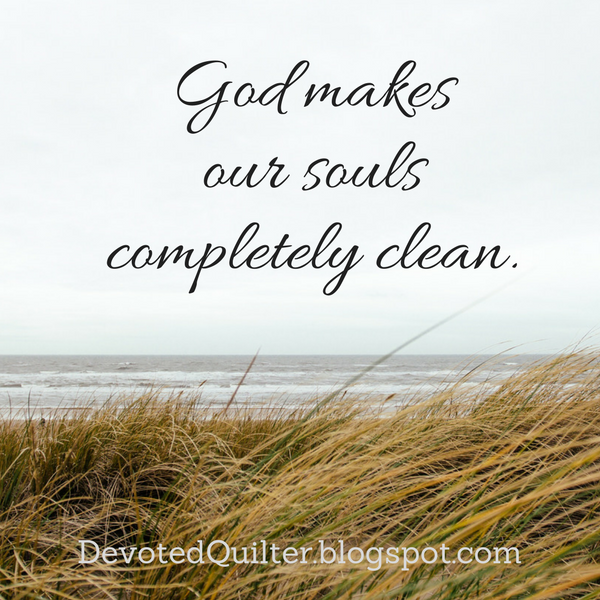 That doesn't happen when God cleanses us from all unrighteousness. That verse really means all unrighteousness. There are no sins that get missed, none that He doesn't see and cleanse when we confess them to Him. Again, I love my dishwasher, but there are some dishes I never even bother to put in it because I know they won't come clean. For some reason any spatula or flipper used to cook eggs will not come clean in my dishwasher. The bits of egg just come out more baked on than they were when I put them in. And the gooey, cheesy mess that's left on the serving utensils after we eat lasagne? Not a chance! There's something about that cheesy stuff that just will not come off unless I wash it by hand (even though the pan I cooked the lasagne in comes perfectly clean. Go figure!). Some of us think there are some sins so bad God can't ever forgive them. Or we think we've been dealing with some sin for so long, there's no way God can take it away. But that's not what this verse says. God isn't like a dishwasher that's capable of dealing with some messes, but not others. He can handle the worst of our sins and remove them from our lives completely. It's not our job to clean up our lives. Did you see that in the verse? It doesn't say that when I get my act together I will be cleansed of all unrighteousness. And thank God for that! I don't have to make myself perfect. In fact, I can't make myself perfect. But if we are willing to go to God and acknowledge all the ways we have messed up, all the things we have done wrong, then He will take care of all of it. All of it. We emerge from that soul cleansing completely clean. There are no baked on sins stuck so tight to us that God couldn't remove them. There are no sins trapped in hard-to-reach places that God couldn't get to. And there are no sins that God just can't remove. Whatever sin we have been dealing with, afraid that God couldn't handle it, we can go to Him boldly and confess that sin, knowing that He can take it away completely. Think about that the next time you're unloading the dishwasher and some of the dishes aren't quite clean. It's time for another update on where things stand with the quilts for the seniors who lost everything in the fire last month. Packages are still arriving almost every day, though it has definitely slowed down from what it was a week or so ago. I have now had parcels from 9 of the 10 Canadian provinces and 1 of the 3 territories. From the US, I've had parcels from 29 states. And I had one envelope of blocks come all the way from Australia! Let's see...here are the quilt tops waiting to be quilted. Here are the bundles I have ready to be assembled. Thanks are certainly due to my friend Michelle for coming over a few nights to help put these bundles together. 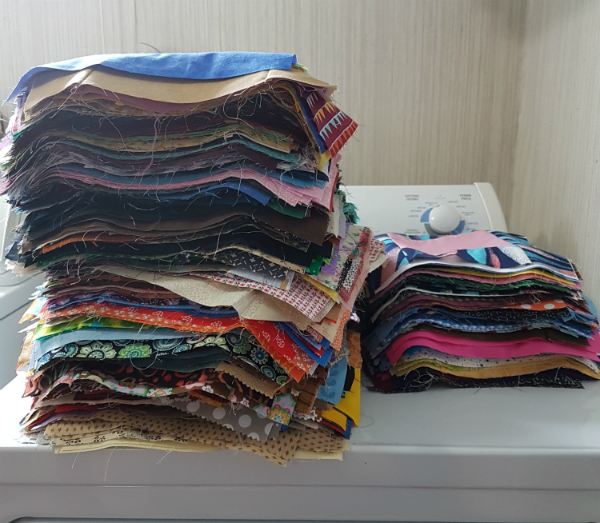 I've been giving out bundles to people to put together, and I'm having a Sew Day at my church tomorrow afternoon, so there will soon be a lot more quilt tops to add to the pile waiting to be quilted. Binding anyone? 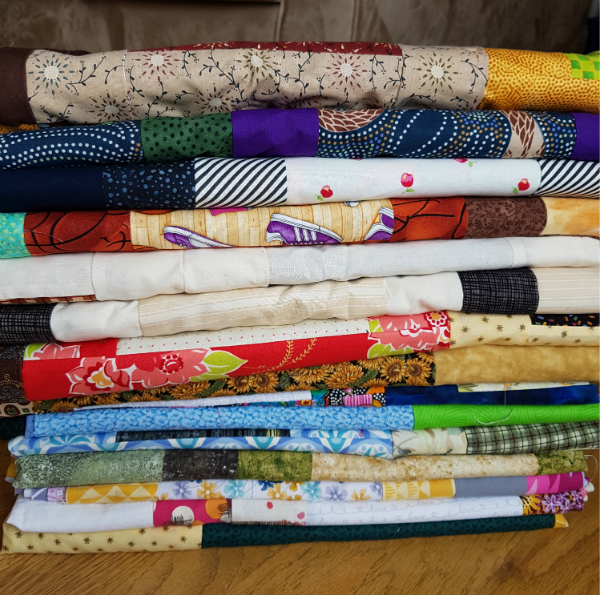 Along with all of this ready-to-go binding, I also have stacks of fabric that can be made into binding. So far I've also given out 6 tops, battings and bindings to people willing to do quilting and binding. This fabulous blue quilt top and backing have been sent out for quilting. Have you ever heard someone read a passage and not bother pausing for the punctuation, so everything just ran together like one big, long sentence? Sometimes when that happens you can miss some of the nuances that are in what you are hearing because you're not hearing the proper pauses, which can certainly affect the meaning. and let her works bring her praise at the city gate (vv. 28-31). For ages I thought the husband was speaking about his wife from 'many women' to 'city gate.' It was as if the husband were saying to his wife "Many women do noble things, but you surpass them all, so it's okay you're not charming and you've lost all your beauty." What?? What husband would say something like that to his wife? Especially as praise?! It wasn't until I finally read the verses for myself that I noticed the quotation marks that ended the husband's words after he tells his wife that she surpasses them all. Okay, then, that's much better! Once I realized they weren't some husband's weird idea of a compliment, I found these couple of verses much more interesting 😊 I find it especially interesting that charm and beauty are set opposite "a woman who fears that Lord." Charm is deceptive. I'm sure we've all known people who are so kind and sweet one minute and then completely nasty the next, as if someone flipped a switch. These people can pour on the charm thick as honey when it suits their needs, but it means absolutely nothing because it's just an act. They have decided, either consciously or not, that pretending to be kind and friendly is the best way to get ahead, but their true nature shows through when they think they can get away with it. Beauty is fleeting. Oh, how true! Have you ever seen a decades-old picture of someone you have only known as a senior? How often do we say something like 'she was a real beauty in her day' or 'he was so handsome when he was young'? I remember seeing a cartoon years ago that showed an older couple on the beach, both rather overweight, and a young 20-something walking past, gorgeous in her bikini. The older woman laments to her husband, "I'll never look like that again" to which the husband replies, "That's okay, dear. Neither will she." What a wise man! But a woman who fears the Lord is to be praised. It's not that a woman who fears the Lord can't be charming or beautiful, but rather that those things are not truly praise-worthy. Charm and beauty are only superficial. A fear of the Lord runs deep into our character and impacts everything of who we are. Honor her for all that her hands have done, and let her works bring her praise at the city gate. A person's fear of the Lord will flow out into their actions. A woman who fears the Lord will show it by all she does and those actions will inevitably be noticed by others. In Bible times, the city gates were where the elders of the town gathered to conduct important business, so this verse is saying that what is done by those who fear the Lord is worthy of praise even by those who are in authority. All of which should make us pause and think. 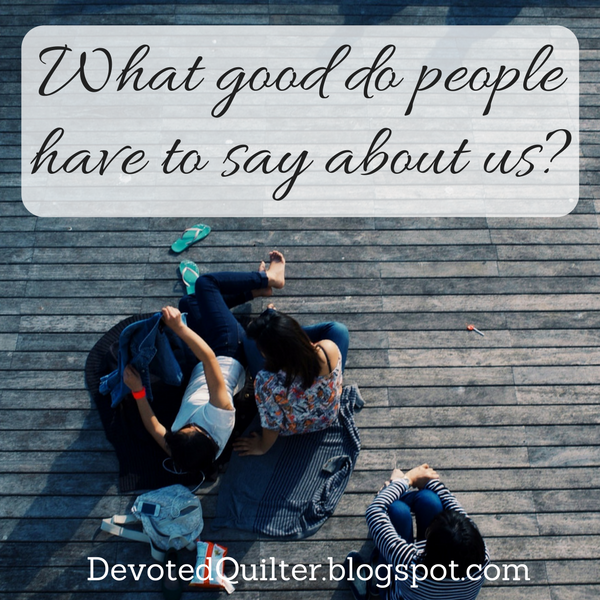 When we come up in conversation, what good do people have to say about us? Is it only about superficial things, or are their words of praise for our actions, which flow from our love for God? I'm excited to finally get to share my Mix it Up! 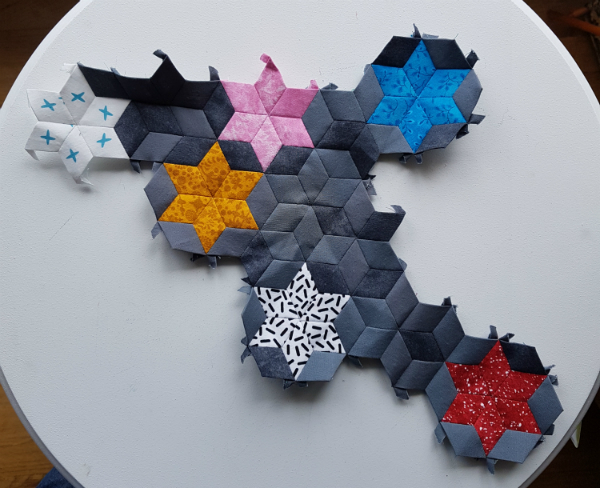 mini quilt. It's in the latest issue of Make Modern magazine (affiliate link), which was just released today. They've also included a lovely profile of me in this issue, for which I am incredibly honoured. I had fun turning the traditional orange peel block into a colour play wall quilt. I chose blue, yellow and green, but you could mix red and blue for purple, red and white for pink...there are so many possibilities! This is my second quilt using black to create a faux border (the first one is my Love Birds quilt). I love how it frames the quilt. It could also be interesting to try the same idea with a different colour, so I don't think this is the last time you'll see the faux border. 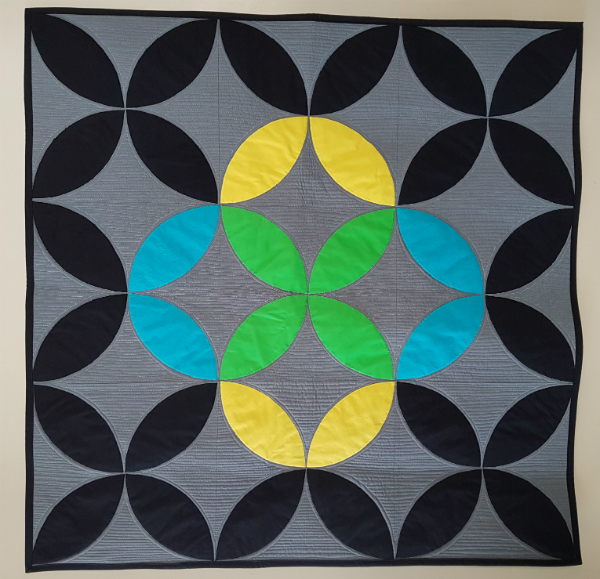 I thought for days about how to quilt the solid grey background. 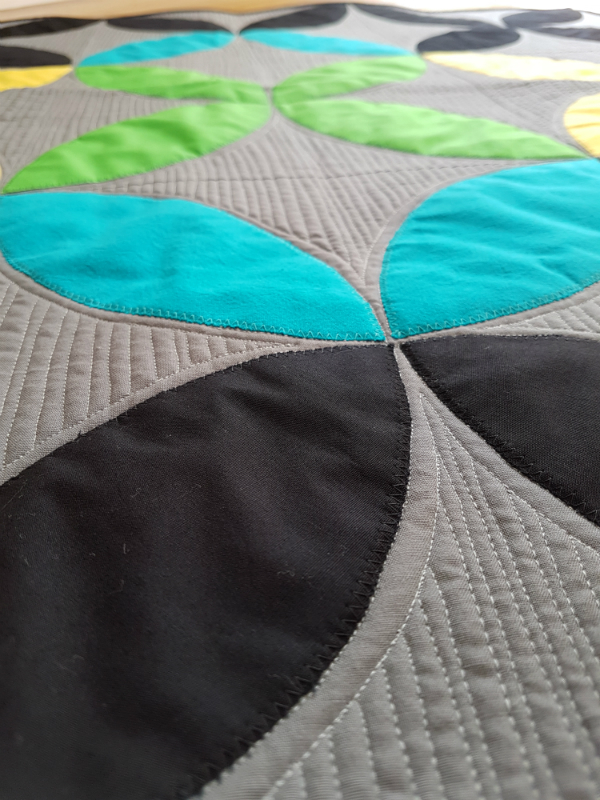 I considered flow quilting, but had just finished a heavily-quilted project (which I still can't show you), so I wasn't really in the mood for that. I considered a swirl-hook design, but that just didn't feel right either...this went on and on and on. Finally, with the deadline approaching, I echo quilted around one set of orange peels and then sat staring at the machine for a moment, needing to just make the decision and Get. It. Done. Already! And that's when I thought of matchstick quilting and I'm so glad I did. I love how it looks! It adds interest while still allowing the orange peels to be the focus. Mix it Up! finishes at 36" square and is made with machine applique orange peels. 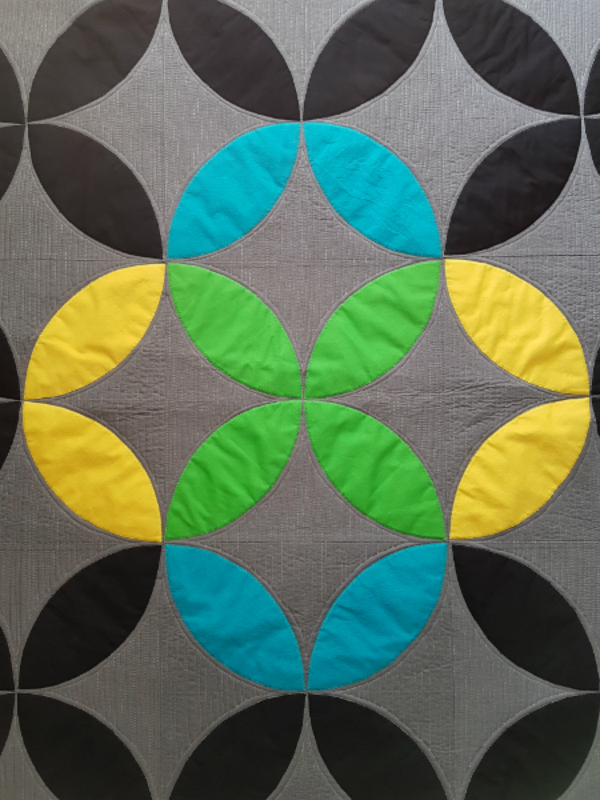 It would be fun in prints or solids and there's lots of negative space for quilting, if you can decide what to fill it with! Now I can't wait to see what you've finished lately 😊 Link it up and then don't forget to visit and comment on some of the other links. It's more fun when we all celebrate finishes together! Edited August 9, 2017 - This pattern is now available for individual purchase through my Etsy and Payhip shops. Get your copy today! *This post contains an affiliate link, which means if you click click the link and make a purchase I may receive a small commission. This does not affect the price you pay. Most of your probably know by now about my block drive to make quilts for the seniors who were displaced by the fire in April. I have been overwhelmed by the response to my request for help!! Quilters are truly the most generous people in the world and I am so honoured to call you all friends. I made the request for blocks barely 24 hours after deciding to go ahead with it and there are a few things I have learned since then. 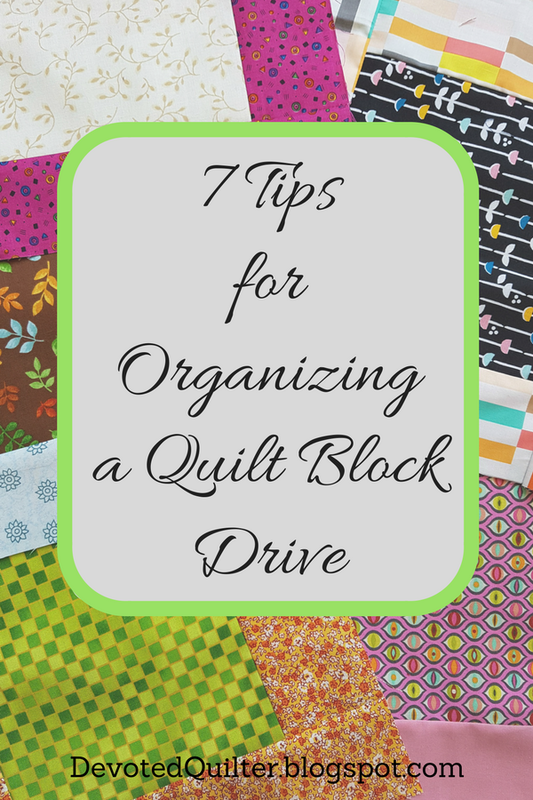 So, if you are considering organizing a block drive, here are 7 things I would tell you. 1. Be prepared to spend a lot of time on your phone or computer. In the first 24 hours after making my request, I could hardly keep up with the emails and comments on my blog, Facebook and Instagram. It was insane! In a good way, but still, it was crazy. After those first 24 hours it slowed down some, but even a week later there were still plenty of messages for me to answer. I chose to keep my mailing address private, rather than publishing it on my blog and social media, which meant a lot of the messages were simply asking where to send the blocks. You could choose to do differently, which would save a lot of computer time, but I wasn't comfortable with having my address public like that. 2. People will offer a lot more than what you asked for. Be clear on what you want. I wasn't expecting so many people to offer things I hadn't even thought about. Could they send me money so I could purchase batting locally rather than them shipping it to me? Could they make entire quilts themselves? Did I want them to make the binding, and if so, what size? Did I want these blocks that were already made, and were an entirely different size from what I was requesting? I made all of these decisions on the fly, answering each question as it was first presented to me. Knowing what you want ahead of time will take some of the stress out of those questions. 3. Choose a simple block and a lot of people will get on board. 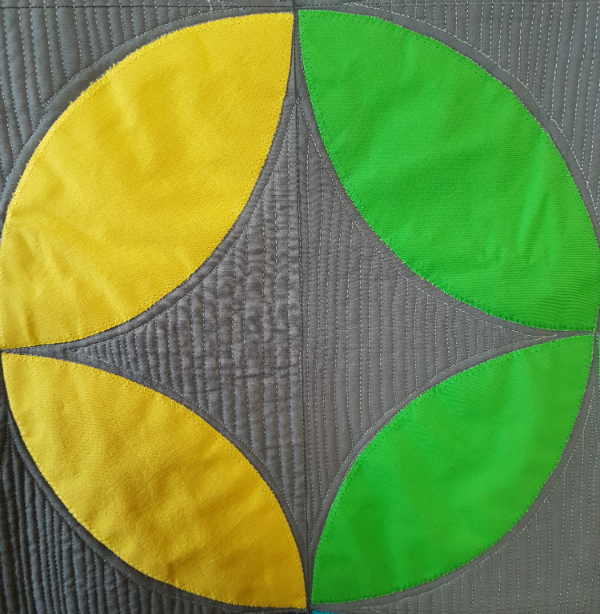 Aside from people's natural desire to help seniors in need, I think the simplicity of the block I chose really encouraged people to join in, especially since it wasn't intimidating for new quilters. And those who made blocks often made more than they set out to make. It was such a quick and simple block that people said they just kept making more and more of them. A more complicated block might not have encouraged that same enthusiasm during the making. 4. Banish the quilt police. Unless you're very specific, not everyone will use the same quality fabric you would use. In fact, some people may even use fabric that wouldn't fit your definition of "quilting fabric." It will all sew together, though, so as long as it looks machine washable, don't worry about it. If you're getting blocks from a lot of different people, you can bet there will be size issues. It's unavoidable, but it doesn't have to be a big problem. In my case, the blocks that turned out smaller than they were supposed to have been grouped together. Sewing them all together means I don't have to worry so much about making them fit with the blocks that are the proper size, and I still get to use everyone's contribution. As for the blocks that are too big, they'll just get trimmed to size. 5. Be clear on where you live. This is one thing I didn't do, but certainly should have. If you're posting your request for blocks on your blog or social media, chances are it will be seen by people in other countries. Being clear on which country you live in will help avoid people making blocks or offering other help and then either being shocked by the cost of shipping to you or not being able to afford to send it at all. 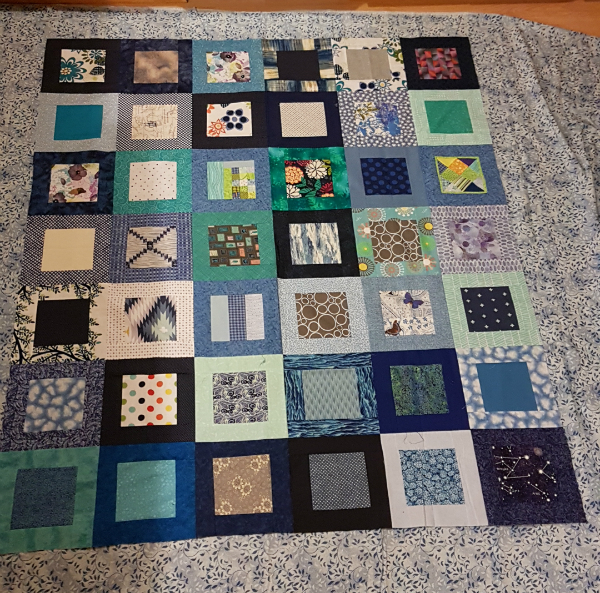 Once the blocks start rolling in, there's a lot of work to be done assembling them into tops, quilting them and putting the binding on. If you're organizing the block drive with a guild then you have built-in help. If you're not part of a guild, though, be sure to put out a call for help from other local quilters. In my case, that has included reaching out to longarmers who might be willing to help with the quilting. You can be sure they'll be a lot faster on their longarms than I could ever be on my domestic machine. If you have access to a space, a sew-day is a great way to get people involved and get a lot of work done quickly. 7. Prepare to be overwhelmed by generosity. Before putting out this request for blocks, I knew quilters were generous. I saw the flags made for Boston, the quilts for Pulse, the quilts for Dallas and the quilts for Fort McMurray. But I think you can't ever understand just how incredibly generous people are until you're on the receiving end of it. You can't understand until you are the one fielding all the offers of help and seeing the stacks and stacks (and stacks!) of envelopes arriving in your mail. You won't really understand, but I'm saying it here anyway. No matter what the cause, or how many blocks you are asking for, be prepared for quilters to go way above and beyond what you need in their willingness to help you as you aim to bless others. Quilters really are the best people! I hope these tips help 😊 Good luck with your block drive! We really like it when things are going well for us, don't we? Not only that, but we make a point of trying to avoid situations that we know aren't going to go well for us. It's human nature to consider our safety and comfort. It's human nature to look out for the safety and comfort of those we care about, too, and if we know of something bad that is going to happen to someone else, we warn them to stay out of that situation. We see exactly that happening in Acts 21. Paul and his traveling companions are in Ceasarea when "a prophet named Agabus came down from Judea. Coming over to [them], he took Paul’s belt, tied his own hands and feet with it and said, “The Holy Spirit says, ‘In this way the Jewish leaders in Jerusalem will bind the owner of this belt and will hand him over to the Gentiles.’"
"When [they] heard this...the people there pleaded with Paul not to go up to Jerusalem" (Acts 21:10-12). Sent by the Holy Spirit, Agabus comes and tells Paul that the Jewish leaders will arrest him and hand him over to the authorities. Hearing that, everyone there tries to convince Paul not to go anywhere near Jerusalem, just as we would do if we heard that one of our friends were to be imprisoned. Does Paul listen to their arguments and stay away from Jerusalem? Not exactly. "Then Paul answered, “Why are you weeping and breaking my heart? I am ready not only to be bound, but also to die in Jerusalem for the name of the Lord Jesus" (v. 13). There was no hesitation on Paul's part, no plan to avoid the hard times that were ahead for him. In fact, he was determined to head straight for those hard times, believing they were exactly what God had planned for him. Now, there are those who think Paul was being disobedient at this point and that Agabus came to tell him not to go to Jerusalem. There are others who think Agabus came only to tell Paul what to expect, not to tell him to stay away. Obviously, I can't tell you for certain who is right, but I tend to agree with those who think Paul was right to go to Jerusalem, mostly because Jesus appeared to Paul after his arrest and said, "Take courage! As you have testified about me in Jerusalem, so you must also testify in Rome" (Acts 23:11). That doesn't sound to me like Jesus was condemning Paul for being disobedient, but rather like He was simply filling Paul in on the next part of the plan. It's kind of like when Agabus came to tell Paul he'd be arrested, but this time Jesus appeared to Paul Himself rather than sending a prophet. I don't think Paul actually wanted to be arrested, anymore than I would want to be arrested. We all want to avoid going through hard times and I don't think Paul looked forward to his imprisonment. But he was still willing to go to Jerusalem, even knowing that he would be arrested when he got there, all because he was convinced it was part of God's plan. "Now I want you to know, brothers and sisters, that what has happened to me has actually served to advance the gospel. As a result, it has become clear throughout the whole palace guard and to everyone else that I am in chains for Christ. And because of my chains, most of the brothers and sisters have become confident in the Lord and dare all the more to proclaim the gospel without fear" (Philippians 1:12-14). What an attitude he had! Rather than whining and complaining about being in chains, he told everyone about Jesus. He watched the palace guard and noticed the effect his words had on them. He listened to stories about other believers who were daring to speak out more boldly and he celebrated that his chains were helping to spread the word about Jesus! I don't know about you, but I have a tendency to focus on myself and my comfort. 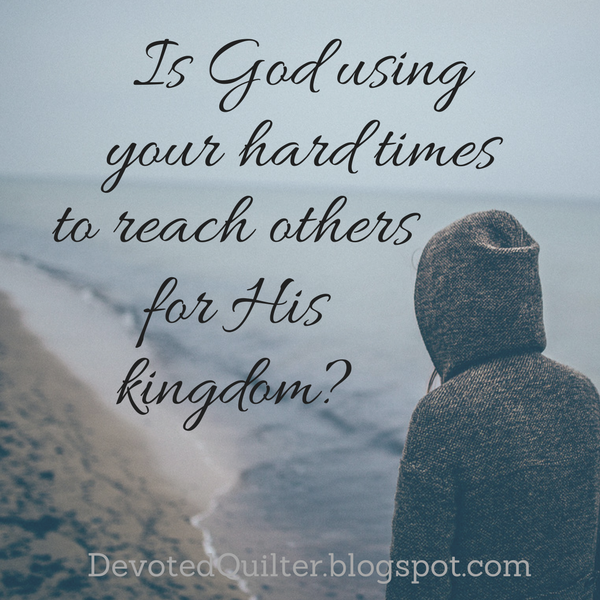 I'm not so good at looking to see how God might be using my discomfort or my pain to reach others for His kingdom. I certainly have a thing or two to learn from Paul. What about you? What is your attitude during hard times?